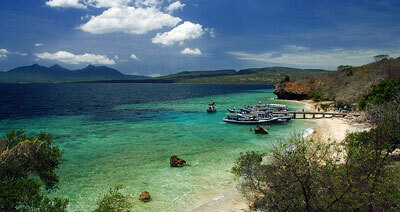 Would you be surprised if I told you that the best snorkeling place in Bali is actually on a different island? I may not have acquired enough snorkeling experience under my belt to be a credible critic of snorkeling areas, but the few times that I have snorkeled have been in pretty spectacular places, like Oahu’s Hanauma Bay and the Bahamas. With that said, I am going to make a grand statement about Menjangan Island: not only is it the best place snorkeling in Bali, but it is the best yet. The color of the ocean shone an indescribable bright blue that still glowed even at the depths of some tens of kilometers below. Ocean life was thriving and abundant, with hundreds of fish swimming literally all around us the majority of the time. It was so exciting to be there and to experience some incredible moments, like when I was afraid to swim into fish because there was just too many to avoid–what a funny feeling! Menjangan Island was such a memorable snorkeling experience that I made myself promise to one day take my nephew and niece snorkeling there, though probably not on their first outing, because they would be spoiled and underwhelmed when snorkeling anywhere else. Simply put, no words can do the underwater beauty of Menjangan justice; luckily for you, the friend I was with shot this video of the magic we saw. The best part? Renting the gear, hiring a guide which you must do because the area is considered part of the West Bali National Park, and paying for the boat ride from port Labuan Lalang and back costed no more than US$20 per person for our group of four. That is, because we bargained and got ourselves local prices although three of us were foreign nationals. In any case, it’s incredibly cheap for about three hours of being out in the water with your own private boat. 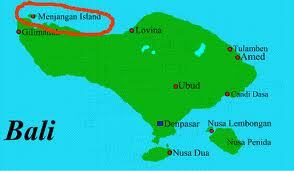 The strange thing is, Menjangan Island does not even show up on Google maps (try it!). The people at Mountain View should probably get around to fixing this problem, because this island deserves to be recognized and known by travelers around the world. It is located off the most northwestern part of Bali, and is only about a 45-minute boat ride away from Labuan Lalang, the port from where you can access the island. I visited this remote area of Bali about a month ago with friends, and we spent two weekend nights at Mimpi Menjangan resort, which is closer to Labuan Lalang than Pemuteran village where many hotels and restaurant are located. The resort is an extremely pleasant place to stay, with its own natural hot spring pools in the premises where we spent most of Saturday night. I highly recommend it if you plan on visiting this part of Bali and are able to spend a little extra (but still affordable if you share a room with friends) on your trip. If that’s not the case, not to worry: there are other more budget-friendly accommodations in the main strip of Pemuteran. We checked out early Sunday morning to go hike in West Bali National Park, but because of our lack of preparation, we did not end up trekking up the Mt. Klataken trail we had initially wanted to, and the whole outing turned kind of into a flop. Our guide, whom we hired out of obligation of entering a national park, seemed to have no clue as to where the trail actually was. And worst of all, this guide was not cheap! But neither is any other national park guide since they all charge a rate of about US$80 for groups between 3 and 5 people. Nevertheless, we still had the chance to take a dip in lovely, refreshing mountain river water, which for me is more than enough! If interested in visiting the West Bali National Park, I suggest planning ahead of time and finding a recommendation for a guide. 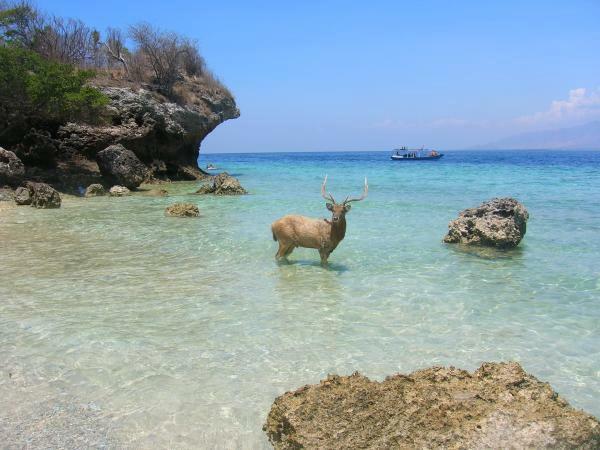 I also suggest to do more animal sighting activities than trekking, because the park is better known for its 160 some species, including the endangered Bali Starling bird and deer that like to hang out by the beach. I was disappointed at not seeing the latter on this trip, so I am determined to go back. Photo credits: Menjangan Island by Bali Metaksu and deer in Menjangan by Villa Semadhi Bali. This entry was posted in Bali, Explore and tagged bali outdoors, bali snorkeling, menjangan, menjangan island, pulau menjangan, snorkeling, taman nasional bali barat, west bali, west bali national park. You really saw what’s on that video? That’s crazy! It’s so beautiful.